One of the hardest positions owners can find themselves in is being unable to afford the treatment cost. As a result, the owner may have to opt for a less effective treatment option, or a less effective treatment option. That's where pet insurance can come in and provide that peace of mind, so that you do not have to make these difficult decisions, allowing you to focus on caring for your pet. We promote Petplan insurance for your pet as they offer a true lifetime policy and cover dental and hereditary conditions as standard, making it no surprise that they are the UKs no.1 pet insurance provider. There are two main plans which Petplan provide, one being a 12 month plan called Essential, and the other being their lifetime plan called Covered For Life®. Take a look at Petplan's full range of insurance plans here. 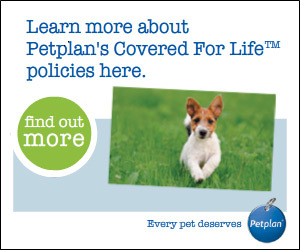 We specifically recommend Petplan's Covered For Life? policies as you don't have to worry about your cover reducing when you claim, as veterinary fees cover renews each year no matter how often you claim, as long as you renew your policy each year with no break in cover. For more information about Petplan insurance please give us a call. You can also take a look at Petplan's website which can be found here.